A fitness gadget skeptic finds a new training tool. Meet UGI. New fitness gadgets enter the marketplace with remarkable consistency. There are some that make it to late night TV informercials and are purchased by half-awake masses of people dreaming of a beautiful physique. Then there are the gadgets that successful personal trainers and conditioning specialists embrace, and they revolutionize what happens on training room floors across the world. Be prepared for UGI to meet the needs of both. UGI (u-gee) is a ball. Well, its a philosphy that includes a ball. The physical description on the UGI website is bang-on, UGI is a weighted ball ‘which has the squish of a beanbag, the bounce-back of a stress ball and the beauty of simple design’. 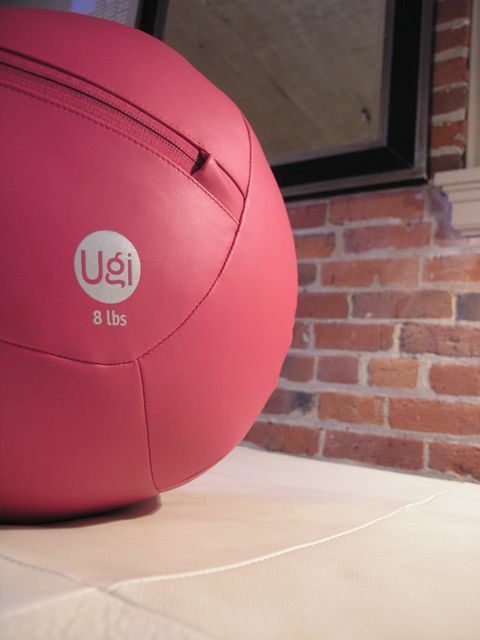 UGI balls come in four weights: 6, 8, 10, and 12 lbs (all are 15 inches in diameter). The UGI ball and philosophy were born out of the wisdom of three active moms, including a personal trainer and gym owner. That’s alot of credibility if you ask me. Read about UGI’s founding story here. I haven’t found a new fitness tool in years that I have embraced so fully. Every personal training session I have delivered over the last 3 weeks has incorporated at least two exercises with a UGI. We bend and lift and twist with UGI, we lunge on it, we sit on it, crunch on it, we toss it and we stretch on it. Training with UGI adds a new twist to classic exercises and it comes with it’s own set of moves that you will be hard-pressed to replicate without a UGI. As a personal trainer, UGI spices up the workouts I deliver. UGI adds a punch of colour and playful spirit to workouts and at times I share playful moments with my clients that many have likely not experienced since their own childhood days on the playground. At the same time UGI is a powerful training tool that kicks the butts of even the most serious exercisers, which is especially fun with those who mock UGI’s pinkness. A plank is transformed, a single leg lunge is redefined, a push-up is progressed, and heart rates are surprisingly elevated. The free UGI App for the iphone is an interval timer that has preset UGI workout intervals plus the option to create your own routines. This is awesome for running circuit classes or incorporating mini circuits into personal training sessions. Home users will appreciate the guided interval workout. I will be using this app alot. Expect to see UGI’s in gyms, training studios, parks, beaches and homes everywhere soon! UPDATED! CLick here for a whole bunch of new Ugi workouts I have created for my personal training clients over the last several months. Handy PDF’s so you can grab and go! Have you tried a Ugi workout yet? What is your favorite Ugi exercise? Sneak some fitness into your winter family fun! Just did my first UGI at Home workout #1. So sweaty, feels great!